This week marked my 12th week of training as well as the 30th running of the Medtronic Twin Cities Marathon, meaning work was CRAZY. It's a little tough to train for a marathon when you're running (organizing) a marathon. With the Health & Fitness Expo opening up on Friday, our team moved into a hotel in St. Paul on Thursday. I think I got a combined 6.5 hours of sleep on Friday and Saturday nights. It was a pretty tough weekend. However, with a little planning, I got almost all of my miles in. The one major fail was no long run this week. There was no way it was going to happen on Sunday. 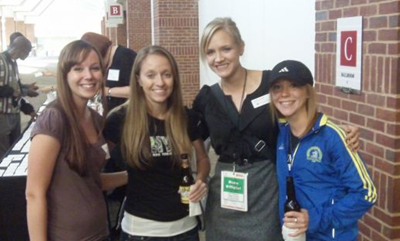 One major highlight was when I met Jeri, Susan and Erika at the VIP reception on Friday, all bloggers, all runners. Aren't they gorgeous? Susan ran a 3:18 on Sunday! Even though I'm still technically following the 55-70mpw plan from Advanced Marathoning, I've begun to cut down on some of the miles and plan to peak out around 62-65 miles from here until the marathon. This week I should have run closer to 57. C'est la vie. My first two intervals were a little slow but I picked it up and was able to maintain a pretty even pace throughout the last four. I ran six intervals instead of 5 because I read the schedule wrong. Bonus points. Glorious early AM run. Seriously perfect morning, though it was dark for the majority of it. Didn't want to run the higher mileage this week so cut out a shorter recovery run. Ran this on the treadmill at the hotel. Left shin/calf tight but it numbs out after a few miles. Ran mile 5 at slightly faster than goal marathon pace because I was bored. Ran a really easy recovery run with our intern, who had run for several months. Fun run. Since this clearly was out of the question. To be honest, almost any run today was out of the question but I found less than an hour to pound out a few quick miles. Running in St. Paul is a different and slightly scary experience. We were staying at the Crowne Plaza on Kellogg and someone suggested that I run along the river. The has paved bike and walking trails along it and it's gorgeous but I was immediately confronted with cat-calls and oh yeah, get it girl. The river paths were pretty deserted and even though it was light out, I didn't feel... safe. I hightailed it back to the hotel for 5.17 miles; 37:33; 7:16 average pace. 0 miles. It was marathon Sunday. I was manning the media tent. It may be an excuse but I think it's a good one.